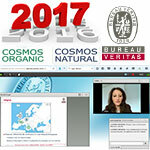 Last March 15, 2016, certification body Bureau Veritas organized a web conference on the COSMOS-Standard, this new natural and organic cosmetics standard mandatory for all new formulas as from 2017. This deadline will also have a significant impact on the products already certified to other standards, and the companies applying for a certificate must think about this transition now. It is more than time to anticipate! Such was the message passed on by Lynda Tezkratt, Cosmetics & Sustainable Development Director at Bureau Veritas, who facilitated the conference. The speaker started by briefly reiterating the origins of the COSMOS-Standard: the fact that there were several European certification labels in organic cosmetics (Cosmébio in France, ICEA in Italy, BDIH in Germany, Soil Association in the United Kingdom, etc.) had led to a certain confusion for consumers, but it was also burdensome for companies, since there was no equivalence between the various standards, even if their basic principles were roughly the same… hence the will to harmonize them all in the form of the COSMOS-Standard.